Created on Sunday, January 4, 2009. 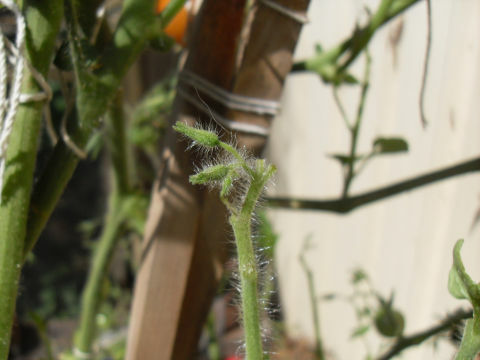 When should tomato plants be pruned? And how should they be pruned? 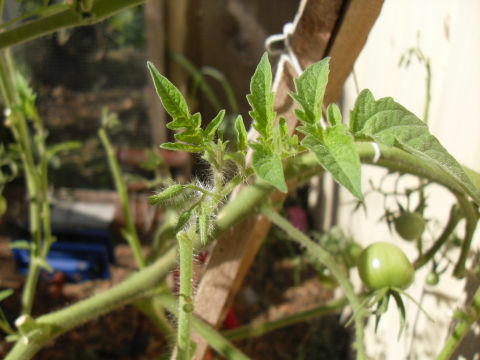 A gardener prunes tomato plants when he feels that the plants are getting too thick, or if there is an infestation of caterpillars, or if the plant needs to be trained onto a trellis or cage. 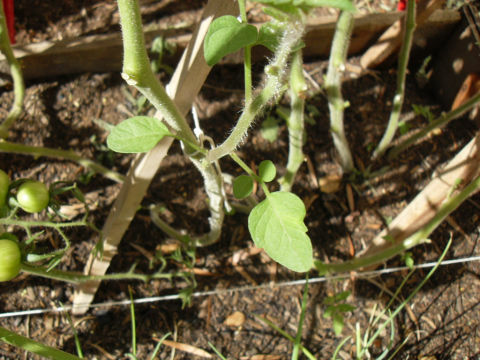 A lot of people don’t prune tomato plants at all, simply tying the stems to a cage and letting the plant grow into itself. The downside of this is that it gives caterpillars a great place to live, allows the plant to be knocked around in wind, and the plant begins fruiting weeks later because most of the plant is shaded out. Merciless pruning is a rule for my vegetable garden, especially for tomato plants. When a leaf is yellow, or has had chunks torn or eaten from it, it gets cut off. When a leaf is shaded out by other leaves it is cut off. I prune hard for energy efficiency: every part of the plant (leaves and fruit) expends energy simply by existing, but only leaves that receive sun take solar energy in. Leaves that are dying, or half-eaten, or shaded out are not photosynthesising anything, and therefore are just eating up resources. These are resources that could go towards fruiting. Generally you will only begin pruning tomato plants once the plant has put out its first fruiting stems and begins to flower. At this point, remove all leaves. The plant will survive! Cut the plant off at the top once it reaches your preferred height. Be sure that the major stems are tied to supports. A week or two later the tomato plant will start putting out new branches. The aim is to remove all the new leaves while ignoring the flower buds, which will later become fruit. Simply cut off all the new growth above the flower buds. I’m not sure if this is common to all tomato varieties, or only to me and mine, but after repeated pruning the plant begins growing round leaves instead of elongated, jagged ones. Perhaps the plant was noticing that I only removed normal-looking leaves, so it began changing some of them? In any case, I leave these on because they photosynthesise and don’t add any bulk.